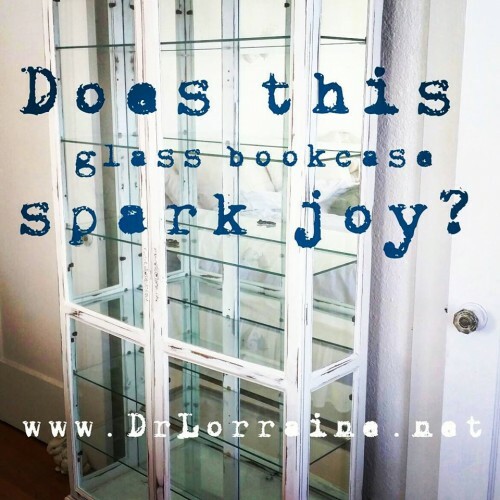 Does this glass bookcase spark joy? A few months ago I read The Life-Changing Magic of Tidying Up . This book proposes a radical concept: touch every item you own, one by one, and ask yourself, “does this spark joy ?” This is rule #1 in the KonMari method, a term Marie Kondo coined by combining parts of her first and last name. Her book sparks joy for me. And it delivers on the promise in her title. It offers “life-changing magic.” It motivated me to start going through different categories of things in my home to find and keep only the things that spark joy. 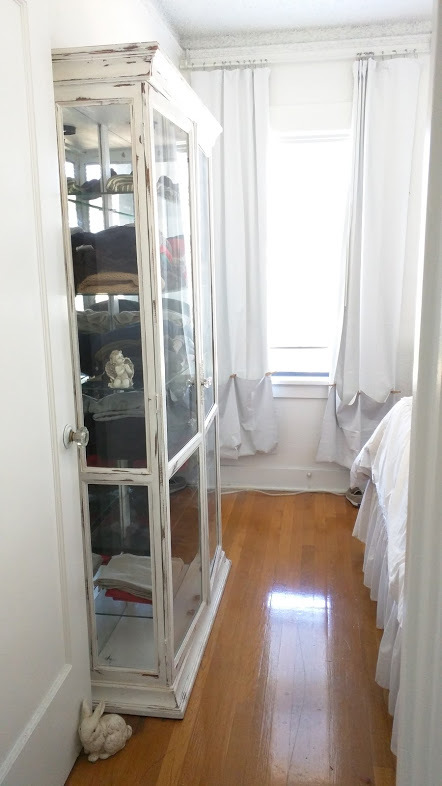 Kondo’s book inspired me to tidy up my clothes which were stuffed in a closet in my bedroom. Plus my office closet was full of dozens of jackets and coats, including many I hadn’t worn for years. By the time I was done tidying up my clothes and jackets, all my favorite items fit into the bedroom closet. And it freed up a bunch of space in my office closet. I was now able to use this closet to store work-related things that spark joy. In addition to tidying up my clothes, I also found the KonMari method useful in other categories of things I owned. I was so pleased with the results that I decided to tidy up our furniture. We had a number of pieces that were tolerable, but now I had this acute awareness that many of the pieces did not spark joy. Because I enjoyed her first book so much, I bought her second book, Spark Joy , when I saw it at Recycle Bookstore in San Jose. 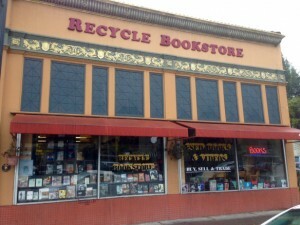 I love buying books from them. Not only do they have great prices and selection, I love to visit with the resident cat. As I started looking at all the furniture pieces in our home, I realized that some of them sparked joy, while others clearly did not. Kondo recommends going through things by category. So if you have a lot of books, which I do, you go around your home and collect all the books you have from every room and stack them up all in one place. And then you quickly go through them one by one keeping only those that spark joy. I need to be honest here and let you know I cheated. I didn’t go around our house and collect all our furniture pieces and put them in one room. My husband is generally cooperative when I ask him to move heavy stuff, but this would have pushed him over the edge. I did, however, take photos of a lot of our main pieces and put them in a Google photos folder where I could see the images all together. This also made it a lot easier when I was out shopping and wanted to visualize what something might look like in a particular location. Does your furniture spark joy? After taking a closer look at all the furniture throughout our home, I realized that we’d have a more joyful home if I made some changes. Some of the pieces had to go, but some of them just needed a paint job or a new location within our home. I had a glass bookcase in our dining room, for example, that served as a nice display case for cookbooks and glassware, but I knew this space was underutilized. 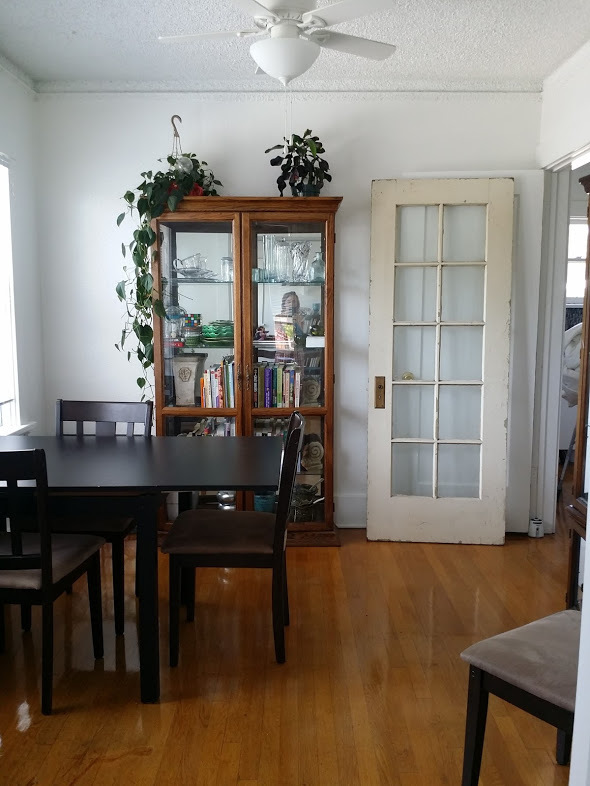 What this dining room wall really needed was a buffet/hutch. It would make the entire room much more functional. But this glass bookcase sparked joy for me and I didn’t want to get rid of it. As I was taking stock of all our furniture, I started a wish list of what I wanted to get to make our home more comfortable. I decided which pieces sparked joy and would stay. And for all the pieces that didn’t spark joy, I thanked them for the purpose they served in my life, as Kondo recommends, and then I listed them on OfferUp and Craigslist. One of the pieces on my wish list was a storage cabinet for the bedroom. I wanted something that was about 5 or 6′ tall, about 3′ wide, and no more than 12″ deep. I wanted a piece that could provide more storage for clothes in the bedroom. And I was hoping to find something white. Ironically, I went to thrift shops, estate sales and used furniture shops, including Not Too Shabby, before realizing I already had the perfect piece! It was the glass bookcase in my dining room. It turns out that this case was just the right shape and size. It fit all the requirements on my wish list for this piece, but I didn’t see it right away because I was so used to seeing it in my dining room. Another thing that clouded my vision from seeing this piece in our bedroom was the dark stain. I wanted something tranquil that would fade into the white walls. I wanted it to feel light, clean, serene. Tami Shidawara-Vasquez is a talented artist and owner of Restoration Illumination. I met her after purchasing one of her pieces at Not Too Shabby. 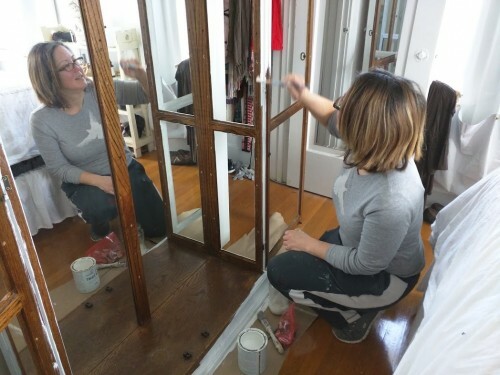 She enjoys projects like this where she can do her magic with Annie Sloan chalk paint and wax. She specializes in giving pieces a new look, and sometimes an entirely new purpose. Since reading Kondo’s books, I handle clothes differently. Now when I come across a clothing item I know I won’t wear again, I immediately set it aside to sell or donate. I typically try to sell things at Crossroads Trading first, and then donate the rest to Goodwill. When I first read The Life-Changing Magic of Tidying Up , I couldn’t put the book down. It kept me up half the night. And the same thing happened when I read Spark Joy: An Illustrated Master Class on the Art of Organizing and Tidying Up . Does it spark joy? It’s such a good question. What’s the point of hanging on to things you don’t love? 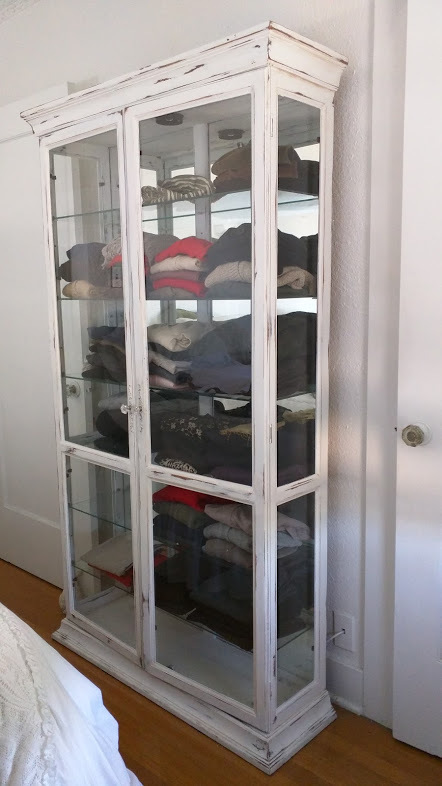 Because this bookcase has glass on the front and sides, it turned out to be a beautiful display case for sweaters. Not only does it provide extra storage for clothes, I can see many things in one glance. This makes it easier to get dressed. And because I already tidied up, now I’m searching for what style I want among items that spark joy. I’m no longer wasting time slipping in and out of things I wouldn’t wear anyway. Finally, the glass on the sides allow the light from the window to shine through into the hallway. It seems that this piece was custom made for this spot, but accidentally got put in the wrong room when we moved in several months ago. When we take the time to slow down and appreciate everything and everyone in our lives, one by one, something magical happens. It’s enlightening. Speaking of light, the curtains are still a work in progress. I hung blackout drapes so that my husband and I can sleep in the dark, but haven’t gotten around to tidying up the window treatments yet. Tami suggested swapping out the hardware for glass knobs. This coordinates well with the existing glass knobs in the house, plus it adds a bit more character to the glass bookcase. The clothes add color to our bedroom while maintaining the peaceful feeling I want in this space. The clothes are much more comfortable in their new space. I’m so happy with how this piece turned out. The entire project, both inside and out, sparks joy for me! And my husband likes the improvement as well. Although Kondo recommends folding most clothes into rectangular shapes and storing them upright, these bulky sweaters work well in this case since they’re in short stacks. I’m so happy this lovely lady came into my life. Kondo’s tidying up methodology awakened me to a magical power from within. People around the world are obsessed with the KonMari household decluttering method. Think for a moment about all the things you’re surrounded with in your daily life. Does this spark joy for you? I love this idea! Unconventional storage methods bring a spark of life to a room. Thank you for sharing!